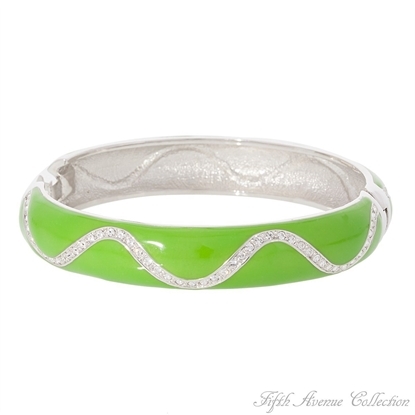 Be "A Cut Above" the rest wearing this bold bangle that’s bursting with style. With its uniquely simple design finished in rich rhodium and hazy hematite, the eye catching cuts of rhodium diamonds will stop onlookers in their tracks. 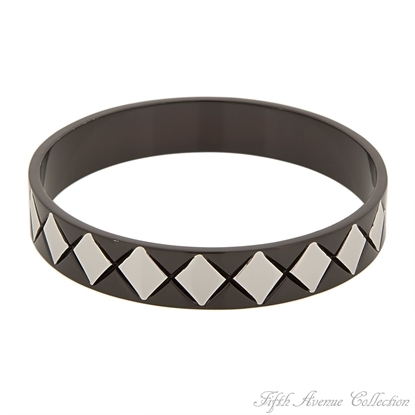 Keep your look as distinct as you with "A Cut Above", Fifth Avenue Collection’s twist on an everlasting classic. 7.5" or 8" Cuff Bracelet. Nickel and lead free. Multiple strands of fine rhodium wire, sprinkled with gleaming pearls of many colours and sizes mingle and dance around your wrist like a romantic whisper. Matching earrings and neckpiece are a must. 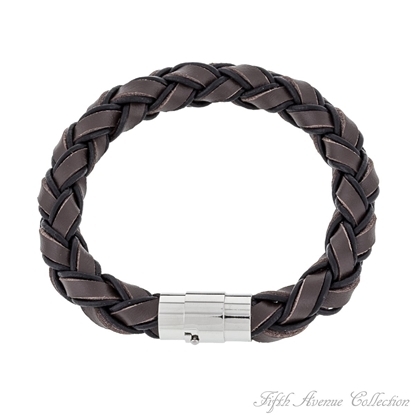 "A Little Lavish", the perfect compliment to your formal gowns or simplest tee.7 ½" Bracelet.Nickel and lead free. Double rows of triple a quality cubic zirconia are brilliant in this intricate square cut setting. 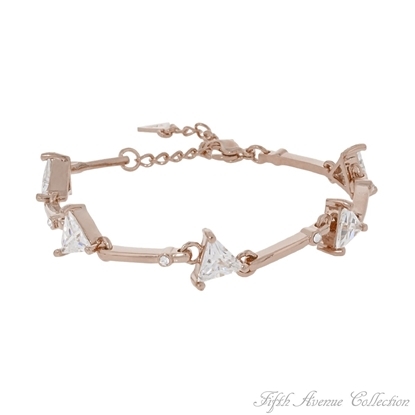 This ravishing bracelet features a slide-in clasp with safety catch. Finished in gleaming gold.7" or 8" Bracelet.Nickel and lead free. Delicate pearls graced with Swarovski’s colourful beads will look as cute as a button on your little girl as she "Acts Like A Lady" wearing this lovely bracelet. 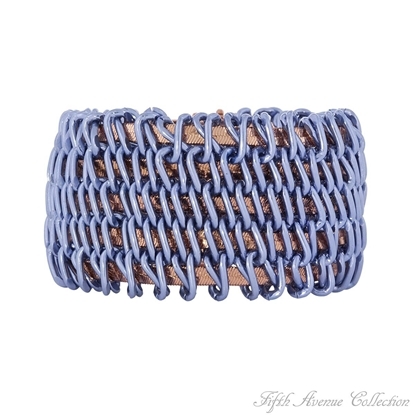 5.5" bracelet with 1.5" extension Nickel and lead free. One thing is for certain, bracelets are an important accessory this season. 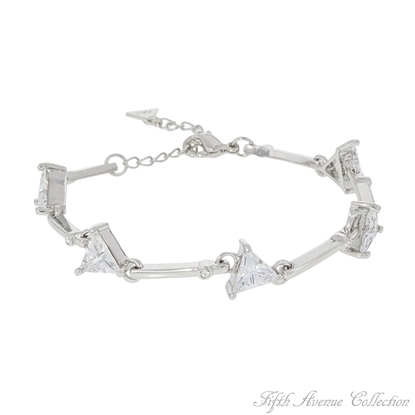 Here's a great one – this bias cut extension bracelet studded with rows of Swarovski white crystal is sure to be a big hit.6.5", 7" or 8" BraceletNickel and lead free. 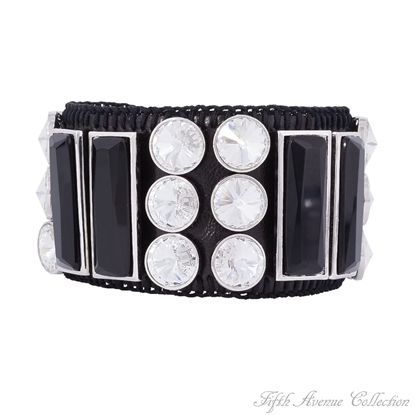 A stylish black macramé cord ties up this stunning bracelet with lightning balls of Swarovski crystal. 7" expandable bracelet Nickel and lead free. This exquisite bracelet has an eastern flair to it, with its beautifully faceted black agate stones. Evoking the tranquil beauty of Tibetan art motifs, a circle of uniquely patterned finished rhodium, decorated with delicate removable rings and a divine black agate charm, unites this piece with a refreshing purity of design. With its composed elegance and foreign appeal, this peace creates a rite of passage to blissful beauty. Fasten your seatbelt and get ready for the most exciting fashion ride of your life wearing this wild and wonderful bracelet. Globes of marbled blue agate, black agate pellets and rounds of natural obsidian, mix in an astonishing medley with Swarovski's copper crystal beads and faceted Venice clear glass. Have a ball wearing this exceptionally beautiful jewellery! 7.5” Bracelet Nickel and lead free. This month go BIG with your fashion with Fifth Avenue Collection's "Big Bling" Wicked limited edition bracelet! 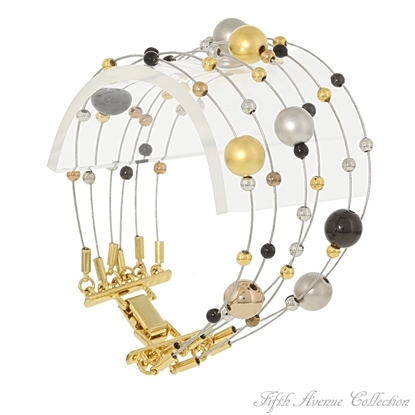 Set on an oversized, supple, designer leather band, stunning groupings of large, impeccably faceted crystal rounds and rich black Murano glass bejewel this piece for bold, brilliant style that pops. Fearless fashion at its best, this phenomenal featured Wicked highlight is a step-up in assured vivacious style! Improving on Mother Earth’s creation isn’t easy, but Fifth Avenue Collection will lead you down the path to a world of beauty when you don this gorgeous bracelet, featuring natural smooth discs of tiger eye from South Africa and faceted black onyx from the heart of India. Add a little sparkle with Swarovski’s finest clear crystal and you’ll be on your way to happiness drinking delicious "Black Coffee". 7" bracelet with 2" extensionNickel and lead free. 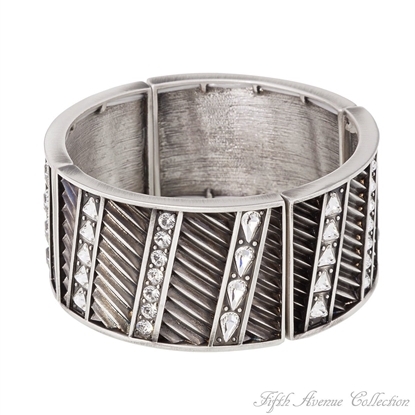 Infuse your style with a fine blend of Fifth Avenue Collection design with this modish bracelet. 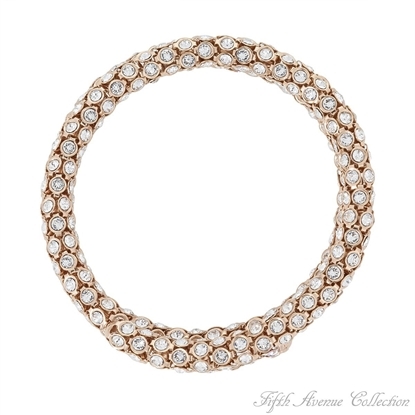 Five sleek strands of rose gold herring-bone chain get an original twist with an intricate meshing of rhodium-finished bars, transformed by a high-end shade of sultry blue. One-of-a-kind color with exclusive presentation, get your own “Blue Ivy” today. 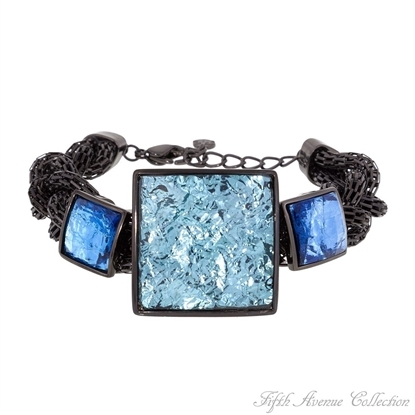 There's something new on the fashion front - vibrant blue marbled glass placed on a twisted mesh chain in jet hematite is sure to get you a rush of compliments. 7.5" bracelet Nickel and lead free. Nothing exemplifies fashion-forward style like an eye-catching touch of whimsy. 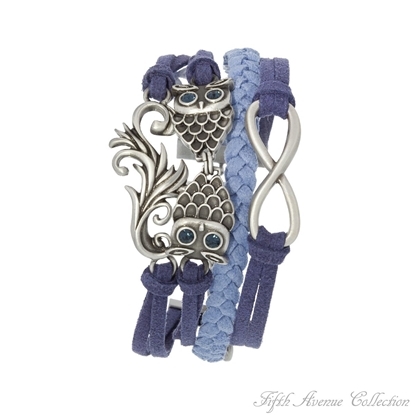 Centered within the folds of blue, plush leather bands, are three uniquely different antique silver charms. An arc of eternity, a capricious bough, and two reflective owls with enchanting sapphire crystal eyes, create a statement piece that will garner the attention of those who appreciate the fine art of jewellery design. Pick a color, any color - the brighter the better! These "Bright Young Thing" cuff bracelets are studded with a continuous ribbon of Swarovski’s sparkling clear crystals. 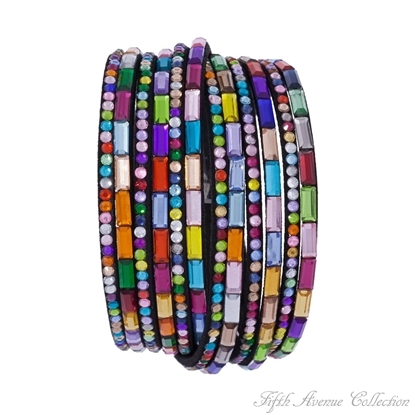 Mix and match these wild and wonderful colors or space them intermittently with Fifth Avenue Collection’s colorful "Gum Drops" bracelets to achieve an unbelievably hot look! 6", 7" or 7.5" Bracelet Nickel and lead free. 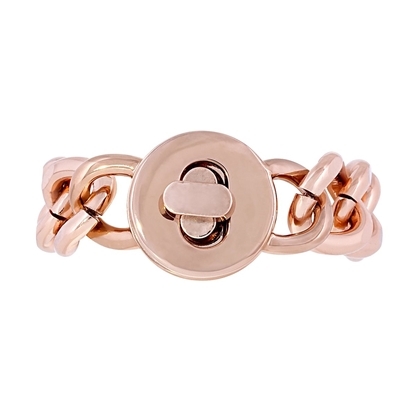 Striking, oversize curb links finished in rose gold create the ultimate statement piece. A rotating-lock designer clasp adds confidence and style to this bold design. 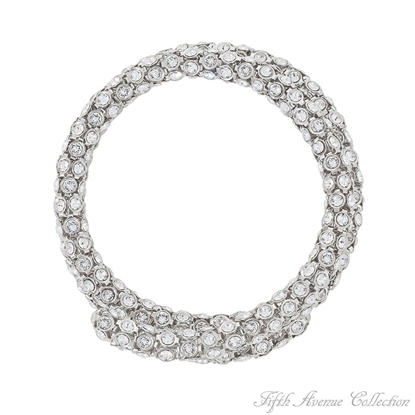 Striking, oversize curb links finished in rich rhodium create the ultimate statement piece. A rotating-lock designer clasp adds confidence and style to this bold design. It's a total knockout! The proof is in the craftsmanship and design. 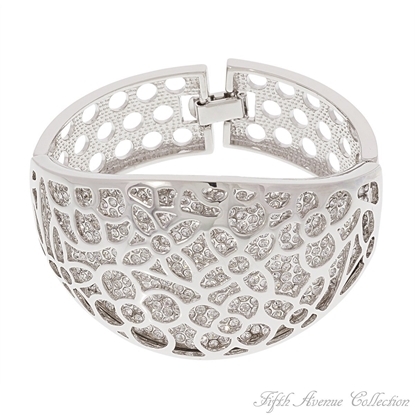 Blazing with Swarovski's white crystal captured under a beautiful filigree design. 6.5", 7" or 8" Bracelet Nickel and lead free. Cool, contemporary design gets a bold flashback with vibrant colors and sleek geometry. Rows of crystal rectangles and circles merge together in impeccably set channels on a multi-stranded black bracelet. Wind this piece twice around the wrist and adjust with a simple snap to set off a kaleidoscope of hues, rich in vitality and style. "Color My World" with happy days wearing Fifth Avenue Collection’s jewellery that sparkles with the brilliance of clear cubic zirconia along with Swarovski’s peridot, amethyst, emerald, aqua and topaz crystal, cut in round, oblong and square shapes, embellished with a rich hematite finish.7.5" Bracelet with 2" extensionNickel and lead free. 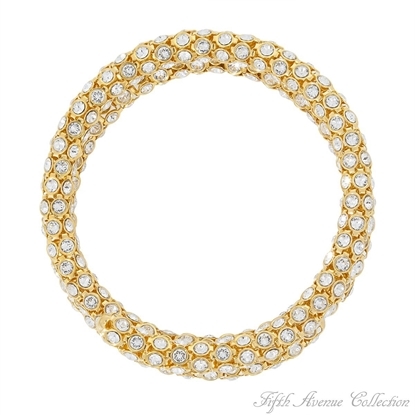 A medley of horseshoes are studded with dozens of triple A quality cubic zirconia in this lovely and most unusually designed tennis bracelet, finished in your choice of rich rhodium or gleaming gold.7" or 8" Bracelet.